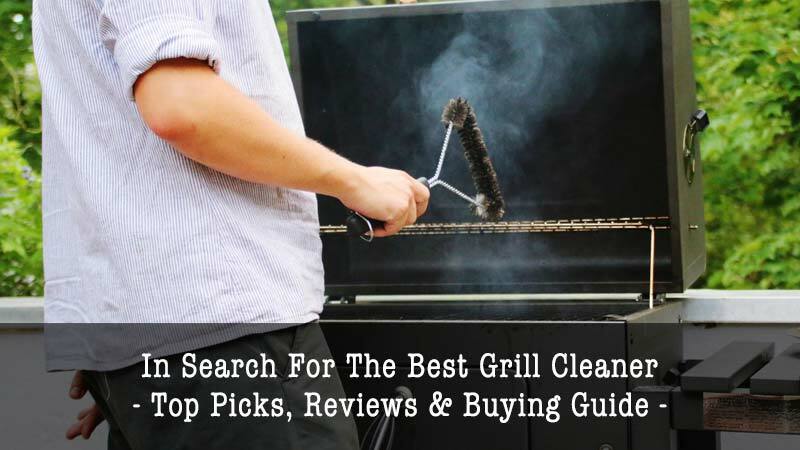 When searching for the best grill cleaner, you want one that will effectively and safely clean your grill. We selected Therapy Premium Stainless Steel Cleaner & Polish. This plant based cleaner uses safe and toxin free ingredients, such as coconut and lavender oil to effectively clean and polish your grill. It is safe for you, your family, and the environment. This tough cleaner quickly removes fingerprints and smudges from stainless steel surfaces. It comes with a microfiber cloth that you can use to buff your grill to a beautiful shine. When you are looking for the best grill cleaner for your grill and other appliance cleaning needs, make sure you check out the features of all possible cleaners. You want to avoid the disappointment of buying a cleaner that does not effectively clean. You want a product that is easy to use. There is nothing worse than being all set to clean and you have to mix products, or find a different bottle in which to pour your cleaner. You should also look for a product that does not require you to need a lot of extra materials like a face mask, rubber gloves, and a drop cloth for the ground. The best grill cleaner will be the most effective. This is the most important feature you want in a cleaner. If it doesn’t work to clean your grill, none of the other things matter. Be sure to find something that works on the type of grill you have. You also want to make sure the cleaner will work for your specific needs. Price should not be the only thing you look at when deciding which is the best grill cleaner for you. However, it should be one of the factors in which you look. You can expect to spend anywhere from $5 to $25 on a grill cleaner. Keep in mind that lower price does not mean lower quality, or that it is less effective. The reverse is also true; a higher price does not always equal a higher quality product. You want a cleaner that will do its job and clean your grill. There are some grill cleaners that are incredibly good cleaning products but contain harsh chemicals like lye. They emit terrible fumes and are not safe to breathe in or come into contact with your skin. These products are not great for the environment. You want a cleaner that is strong on stains and food particles, but not bad for the environment. Look for products that do not contain phosphates or lye. Be sure to read the directions to determine if you need to take precautions and wear protective clothing. They emit terrible fumes and are not safe to breathe in or come into contact with your skin. These products are not great for the environment. You want a cleaner that is strong on stains and food particles, but not bad for the environment. You are looking for the best grill cleaner, but it is also good if an effective cleaner can be used on other appliances. I do not like having a ton of cleaning products in my house and each product cleans something different. It is nice to find a product that has more than one use. If you can find a cleaning product that effectively cleans your grill and other appliances, you can eliminate a few cleaning products from the arsenal in your cleaning closet. What you will love about Therapy Premium Stainless Steel Cleaner & Polish: It is a plant based product that cleans and polishes. 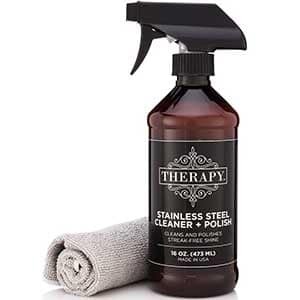 Therapy Premium Stainless Steel Cleaner and Polish is a stainless steel grill cleaner that is plant based provides amazing cleaning results while being safe and toxin free. You can protect and clean your grill in one easy step. It removes fingerprints, smudges, and streaks from all stainless steel surfaces, including an outdoor stainless steel grill. A large sized (14 x 14) microfiber cloth is included with Therapy Premium polish. Simply spray the cleaner directly on your grill and wipe with the cloth. Then you can be amazed at your clean surface. The coconut oil in the cleaner adds a beautiful and protective shine. Ingredients of the cleaner and polish: essential lavender oil, filtered water, coconut oil, sorbitan monooleate acrylates copolymer, methylisothizolinone. Therapy has been in business since 2016 and their mission is to create products that take the stress out of cleaning. Their mission is to provide toxin free products that work well and smell amazing. Pros: Safe and toxin free. Cons: A little goes a long way. You should only use a little bit of the product. Click here to purchase Therapy Premium Stainless Steel Cleaner & Polish. What you will love about Easy-Off Professional Fume Free Max Oven Cleaner: It uses unique cold oven technology to clean tough baked on food without harsh chemicals. Easy Off is the best grill cleaner according to its customers that have rated it the number one cleaner in the US. Most households know the name Easy Off and have used it for years. This is one of the toughest stain fighters available. It cuts through food burnt on to your grill in about five minutes. Your food will taste so much better when it isn’t cooked on a grill with burnt on food residue. Easy Off is safe for regular every day use. There is no need for you to wear gloves or any protective covering. It does not contain lye or any other harsh chemical. This cleaner does not have any fumes, but is also available in a lemon scent. This is an inexpensive cleaner compared to most on the market. Don’t let the small price tag full you, this is one amazing grill cleaner. It is simple to use. Spray the cleaner on your grill and wait for it to dissolve the stains. All you have to do is wipe it away. 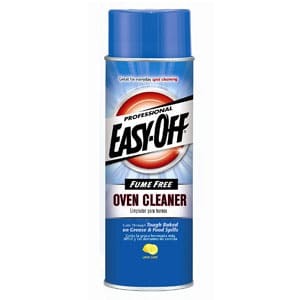 Easy Off Professional Fume Free Max Oven Cleaner comes with a low range price point of around $4 to $7. Pros: No fumes, no scrubbing needed. Cons: It can take up to 40 minutes to do a deep clean. Click here to purchase Easy-Off Professional Fume Free Max Oven Cleaner. What you will love about Easy-Off Professional Oven & Grill Cleaner: It is truly heavy duty and cuts the deep clean time in half. Easy Off Professional Oven and Grill Cleaner is heavy duty and cleans up the worst baked on food in less time with its special formula that cuts grease. Easy Off customers have named this a best grill cleaner. It can be used every day for small spots or quick cleaning. It about only five minutes, you will see your grill shine. For tougher stains, you can let the cleaner sit on a cold grill for about 20 minutes, then wipe away the stains. You won’t need to scrap or scrub. The cleaner does all the work for you. This BBQ grill cleaner does require you to wear gloves and a mask when you are using it. You can use your grill immediately after cleaning it. Easy off recommends you heat your grill to 300 degree for about 15 minutes before use because there may be some steam or smoke that comes off of it after cleaning. It’s best to make sure there are no pets around until all the smoke clears. 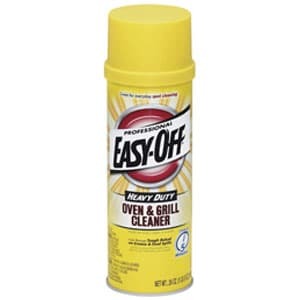 Easy Off Professional Oven and Grill Cleaner comes with a low range price point of around $4 to $7. Pros: Strongest formula for burnt on food, relatively inexpensive. Cons: Strong odor. Might cause steam or smoke when using your grill after cleaning. Click here to purchase Easy-Off Professional Oven & Grill Cleaner. What you will love about Weiman Stainless Steel Cleaner and Polish Wipes: They are the best stainless steel griller cleaner you will find. Weiman is a name you can trust and these wipes are the best stainless steel grill cleaner you can buy. These wipes have a special formula that is pH neutral so it dries fast to shine all your stainless steel surfaces. These wipes quickly attack those fingerprints you are tired of seeing. They cut through the grease and built up residue while getting rid of any hazy streaks other cleaners have left behind. The Weiman Stainless Steel Wipes will make your grill look showroom perfect again. You benefit from their high expectations of their products and their experiences from cleaning commercial products which they have brought to their household products. The result is a wipe that cleans up the worst messes, avoids scratching and staining, all while polishing and protecting your stainless steel grill. Weiman Stainless Steel Cleaner and Polish Wipes comes with a mid range price point of around $13 to $16, depending on where you buy them. Pros: Quick and easy to use wipes, no extra cleaner needed. Cons: Not intended for grill grates, not food safe. Leaves residue behind, so you must buff with a micro fiber cloth after using wipes. Click here to purchase Weiman Stainless Steel Cleaner and Polish Wipes. What you will love about Weber Grill Cleaner Spray – Professional Strength Degreaser: It is a non toxic spray that has been approved by the USDA to be safe. Weber manufactures some of the best grills available. They have also developed the best grill cleaner spray to care for their grills. This cleaner is not flammable, not corrosive and not toxic. It has been approved by the USDA to be safe. It does not contain phosphate and it biodegradable. This cleaner is safe for the environment, safe for you and safe for your grill. This spray is citrus based and uses 100 percent d-Limonene. This spray can be used on a cold grill. You do not have to waste fuel by hitting up your grill to burn off cooked on food. Turning on the grill to burn off the grates can waste over $10 worth of fuel. You do not need to wear gloves as this spray will not irritate your skin. You do not need to wear a mask because this product is non toxic and has a pleasant scent. The Weber Grill Cleaner Spray – Professional Strength Degreaser comes with a mid range price point of around $10 to $12, depending on where you buy it. Pros: Non toxic and phosphate free, biodegradable. Cons: Spray goes fast, one bottle does not last long. Click here to purchase Weber Grill Cleaner Spray – Professional Strength Degreaser. What you will love about CLR PB-BBQ-26 BBQ Grill Cleaner: It is a water based formula without abrasives or petroleum. CLR barbecue grill cleaner is a powerful cleaner that is tough on baked on food and residue, but is gentle on grass and vegetation. This powerful spray is made in the US with the best possible ingredients. It does not include acid or petroleum, and it is not abrasive. The spray is non toxic and biodegradable, so it is safe for anyone to use it. The powerful foam cuts through the toughest stains and grease in about three minutes. After letting it soak, simply rub the grill with a cloth or brush and thoroughly rinse with water. This grill cleaner spray makes clean up easy and fast. It can be used on any product, as long as it is made of stainless steel. The CLR PB BBQ 26 cleaner comes with a mid range price point of around $12 to $20, depending on where you buy it. Pros: Does not contain acids and is safe for pets and plants. Cons: If ordered online, the product often spills out of the bottle. 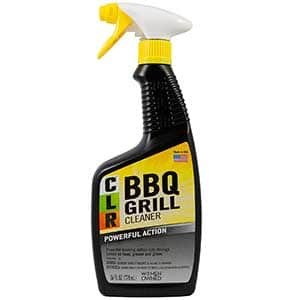 Click here to purchase CLR PB-BBQ-26 BBQ Grill Cleaner. What you will love about Diversey Break-Up Professional Oven & Grill Cleaner: It is a powerful, institutional formula that works immediately. Diversy Break Up Professional Oven and Grill Cleaner is the best grill cleaner that works immediately on contact. It is an aerosol spray that attacks anything you bring its way. It cuts through grease, it eats away at baked on food particles, and it handles carbonized messes. There are no CFC’s in this aerosol spray. This product can be used as a charcoal grill cleaner. It can be used on hot or cold grills. Simply spray the cleaner on your grill and wipe away with damp cloths. This cleaner does all the scouring as it works through the food and grime. You do not have to scrap at thing. You should wear gloves and use this cleaner in a well ventilated area. The Diversy Break Up Professional cleaner comes ready to use. There is no mixing needed. The aerosol can comes with a reusable foaming spray trigger. It is also available in a gallon container with a foamer spray trigger. Diversy Break Up Professional Oven and Grill Cleaner falls into the lower range price point for grill cleaners. You will spend around $5 to $14 for one aerosol can of Diversy Break Up. Pros: Cleans immediately on contact. Cons: Contains lye, must use in a well ventilated area. 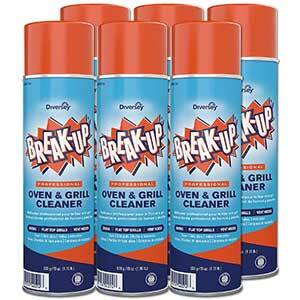 Click here to purchase Diversey Break-Up Professional Oven & Grill Cleaner. What you will love about Mr. Muscle Oven and Grill Cleaner: It works quickly with its institutional strength formula. Mr. Muscle Oven and Grill Cleaner is the muscle to clean your grill, so you don’t have to be. This cleaner is a degreaser as well, so it cuts through any grease on your grill. It works quickly to power through any baked on food with institutional strength. Mr. Muscle scours and adheres to the particles on your grill on contact to break up the toughest grease and grime. You can use this cleaner to spot clean and wipe it up right away. You can also let it sit on hard stains and wipe it up after giving it time to soak in. You can use this cleaner on a hot or cold grill. This cleaner is intended for the inside of your grill. Do not use it on the outside. This cleaner is unscented, but it does chemicals in it, so be sure to wear face covering and protect your skin while using it. It should not come into contact with your skin. Mr. Muscle Oven and Grill Cleaner falls into the lower range price point for grill cleaners. 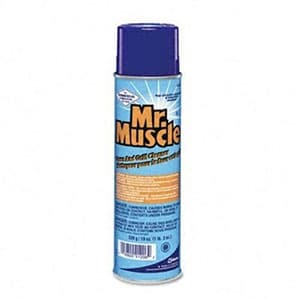 You will spend around $5 to $15 for an aerosol can of Mr. Muscle. Don’t let the lower price fool you, it is a strong cleaner. Pros: Works immediately on a hot or cold grill surface. Cons: Strong fumes, need to cover skin and wear a mask. Click here to purchase Mr. Muscle Oven and Grill Cleaner. What you will love about KRUD KUTTER KK32 Original Concentrated Cleaner/Degreaser: It is super concentrated and ready to use. Krud Kutter is a trusted name for serious cleaning. It is a best grill cleaner because it has concentrated super strength but does not have nasty fumes or vapors. It is a water based cleaner that is not toxic, not flammable and xylene free. It does not contain phosphates or hazardous material. It is biodegradable and not harmful to the environment. This cleaner is completely manufactured in the US. It can be used at full strength directly on your grill for heavy cleaning, or you can dilute it depending on your other cleaning needs. This cleaner is safe enough to use on any surface inside and outside of your home. It is also fairly inexpensive with a price point around $5 – $13, depending on where you purchase the cleaner. Pros: Safe to use anywhere. Cons: Some individuals were not happy with the cleaner. 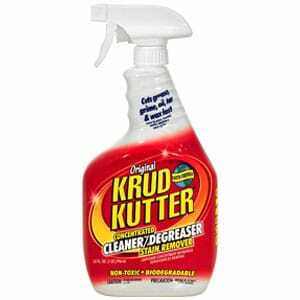 Click here to purchase KRUD KUTTER KK32 Original Concentrated Cleaner/Degreaser. Citrusafe is the best grill cleaner for grids and grills. This charcoal grill cleaner is not Flammable, not corrosive, and not toxic. It is biodegradable and free of phosphates. Citrusafe uses d-limonene, a compound of citrus, to safely clean your grill. This cleaner will not harm or irritate your skin. It is safe around food, so you can use your grill immediately after cleaning. Even though this cleaner is safe, it doesn’t sacrifice the strength to work hard on cleaning your grill. You do not have to heat your grill to warm up the particles before cleaning with Citrusafe. This saves you money over the longterm because you aren’t burning fuel every time you clean your grill. Citrusafe Grill Cleaning Spray for BBQ Grid and Grill Grate falls into a mid range price point for grill cleaners. You will spend around $9 to $13 for a bottle of Citrusafe. Grill cleaners can cost as much as $20 – $25. Pros: Uses citrus compounds for a safe, but effective way to clean the grill. Cons: The citrus based cleaner may not work on tough stains. 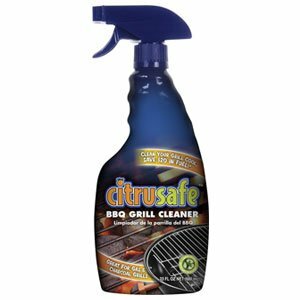 Click here to purchase Citrusafe Grill Cleaning Spray – BBQ Grid And Grill Grate Cleanser.